My name is Srinivas and I am from Anaicut district in Andhra Pradesh. I live with my wife, Ramya, and my 3-year-old daughter, Gopika. When my daughter was 2 years old, we came to know from the doctors that she is suffering from Griscelli’s Syndrome type II with Hemophagocytic lympho-histiocytosis (HLH). Doctors told that it is very rare condition and the treatment needs to begin immediately. We were shocked to hear this but what can we do, we had to quickly arrange for the money. I work as a helper in a sweet shop near Vellore and earn only Rs 350. I have only completed grade 6 and is not qualified for a better paying job. My wife is a homemaker and takes care of Gopika. We mortgaged our only house and got some money. We have to take her to the hospital three days a week. He develops a very high fever at times and becomes critical. Doctors informed that a bone marrow transplant is a solution to help my daughter. My wife and I were tested and found to be 50% match to become the donor. The cost for treatment is Rs 25 lakhs. I am struggling to even pay for her weekly treatment and I don't know how I will manage this huge amount. My elder brother is polio-stricken and is dependent on us. My sisters have been trying their best to support me. Any help from you will save my child. You can donate through this campaign and the funds will be transferred to the hospital. I will ensure all of you get details on the treatment regularly. We have some good news to share. As we have posted in the last update, Gopika is doing very well now. She has come back to normal life and has started going to school again. She has to be on follow up for once in 3 months. At times, she gets rashes in her skin, apart from that there are no side effects also. We are extremely thankful to everyone who has contributed for her campaign. Most of the funds have been utilised for her treatment only. Remaining funds will be transferred to Gubindra. Gubindra is diagnosed to have hepatoblastoma and he needs to undergo Hepatectomy as early as possible. Family once again would like to thank each and every one of you for the wonderful contributions you have made for Gopika's treatment. Please include Gopika in your prayers. Here is an update on Gopika's health. Currently, Gopika is at home and doing better. She had responded well to the treatment and has become an active kid now. Earlier Gopika had high blood pressure problems but with continued treatment and regular checkups, her blood pressure is normal. She has to go for monthly checkups but the doctors are of the opinion that she will recover completely in next two months and the medication will be stopped. We have a good news to share. Gopika’s health conditions have stabilized and she has been showing good progress day by day. Her parents have welcomed a baby boy to the family and Gopika is thrilled to have a little brother. “Gopika is active and is very happy to play with her baby brother” says Srinivas. They are still residing at a place near the hospital since it is important that Gopika is free from infections and can reach the hospital for regular check ups. The further course of treatment for Gopika will be decided after the results of her blood tests come in. 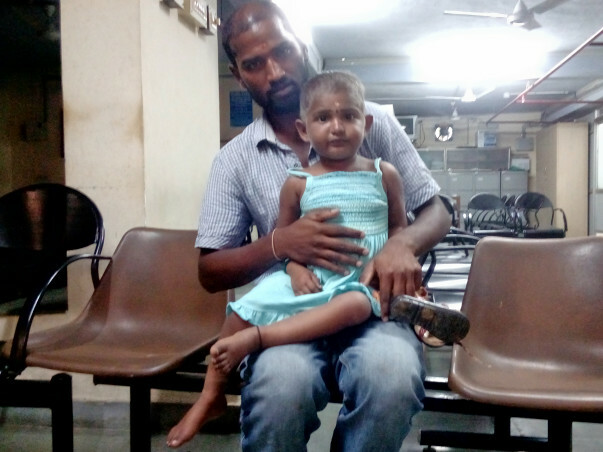 Srinivas has conveyed his gratitude to all of you for saving his little girl.